Agriculture is a staple of the Kansas economy, with nearly 62,000 farms in the state yielding essential crops and foodstuffs like wheat, grain, sorghum, and beef. Of those 62,000 farms, a vast majority of them are family-owned ranches and farms. Did you know that roughly 86 percent of all of the farms in the state are family-owned? That’s why it’s so important to Woofter Construction that we can make sure these operations have the equipment they need to protect their crops. 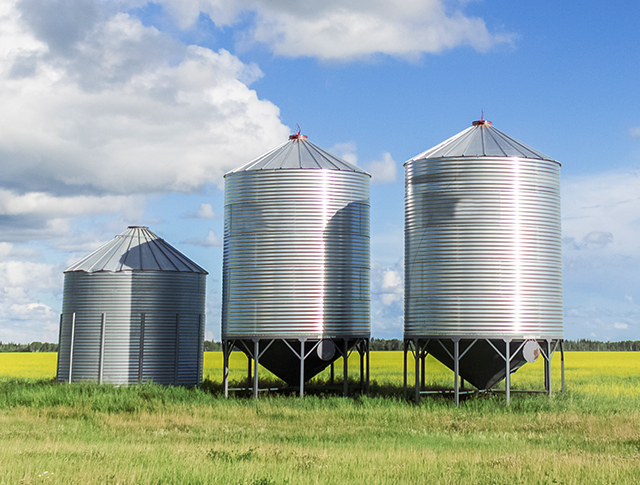 At Woofter Construction & Irrigation, we’re proud to provide many of those farms with grain storage bins. Although we’re well-known for some of our bigger projects, like our 1.1 million bushel steel grain bin, we don’t just work with large commercial ventures. Woofter is happy to provide personal grain storage for the family and local farms that are so important to our state and our communities. Whether you’re saving large quantities of grain into the summer or the following year, or you’re simply looking for a feed bin for your livestock, it’s important that your crops are stored properly. A wide variety of factors can impact your grain, from heat and humidity to aeration and insects. With high-quality and reliable grain storage bins from Woofter Construction & Irrigation, you don’t have to sweat the small stuff because you’ll know your grain is in good hands. Keeping grain cool and dry is crucial, and our line of grain storage and handling products allows you to do just that. The aeration systems in our bins allow you to properly manage the temperature and keep your grain at the appropriate temperatures. The ability to easily cool grain allows local farmers to reduce moisture migration, slow down mold growth, and battle potential insect infestation. Depending on the size of your grain storage bin and how you plan to use it, we also offer agricultural fans to help reduce heat deterioration and moisture damage. There’s a reason we’ve been in business for over 40 years. Our commitment to customer service and satisfaction is unparalleled in the industry. No matter what your personal grain storage needs are, we can accommodate you. Even if you aren’t sure exactly what you need, our team of knowledgeable experts can point you in the right direction and make the appropriate recommendations based on your budget. We’re happy to help every farm in Kansas, Colorado, and Nebraska get the equipment and supplies they need. We’ve been providing farms of all sizes with top-of-the-line equipment since 1978. If you need to outfit your farm with new grain storage bins, or if you’re looking to expand your storage without breaking the bank, contact Woofter Construction & Irrigation today, or fill out the quote form at the bottom of this page. We love working with local farmers to ensure they have the supplies they need for success!